화면 가득 화려하게 장엄된 여래를 단독으로 그린 괘불인데, 괘불이란 절에서 큰 법회나 의식을 행할 때 법당 앞 뜰에 걸어 놓고 예배를 드리는 대형 불교그림을 말한다. 이 괘불은 길이 8.70m, 폭 4.74m의 관음보살 입상으로 광배의 끝부분은 화려한 색을 이용하여 불꽃무늬를 표현하였고, 불꽃무늬 안에는 좌우에 각각 작은 불상을 10구씩 두었다. 머리에는 수많은 부처의 얼굴이 있는 보관을 쓰고 있으며, 그 좌우에는 봉황이 그려져 있다. 이목구비는 작게 표현되었고, 신체에 비해 얼굴이 크게 그려졌다. 연꽃 가지를 들고 있으며, 화려한 장식과 문양의 옷 모습이 화면을 압도한다. 채색은 주홍색을 주로 사용하였으며 녹색과 분홍색, 흰색을 이용하여 은은한 분위기를 표현하였다. 숙종 18년(1692)에 화가 명원(明遠) 등 4인이 그린 이 괘불은 전체적으로 화려하고 은은한 무늬와 색상이 17세기 후반 불화의 모습을 잘 표현하여 통도사괘불탱화 및 무량사미륵불괘불탱화 등과 함께 장엄형 괘불탱화의 최고 걸작품으로 인정받고 있다. This type of large-sized painting used to be hung in the front courtyard of a temple hall at an open-air sermon session or ritual. The painting measures 8.70m (L) by 4.74m (W). 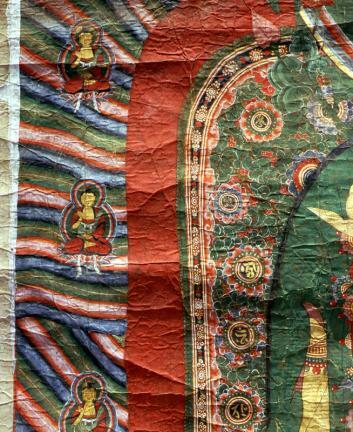 The edge of the mandorla is adorned with flame patterns in flamboyant colors, with ten miniature Buddha images to the left and right of the Buddha. The crown worn by the Buddha contains images of many miniature Buddha faces and phoenixes. The face is disproportionately larger than the other parts of the body. Avalokitesvara holds a lotus twig. With its gorgeous adornments and patterns, the robe dominates the canvas. Crimson color is mostly used, with green, pink, and white colors creating a hazy, subdued atmosphere. The piece was made by four painters, including Myeongwon, in 1692 (the 18th year of King Sukjong’s reign). 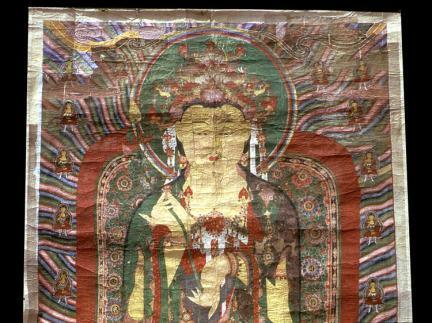 The overall flamboyant and hazy colors and patterns carry a feature of the Buddhist paintings of the 17th Century. 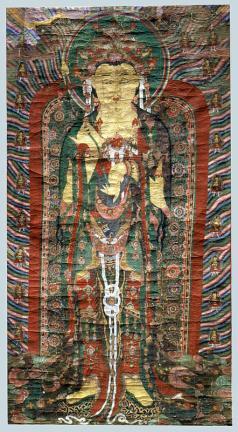 This one, along with the hanging paintings in Tongdosa and Muryangsa Temples, is said to be one of the best hanging paintings made in the country.